Monday 29th October, 7.30pm at the Gluck Studio. A fitting literary celebration for the week of All Hallow’s Eve – it’s time to dive into the dark side with Elly Griffiths! 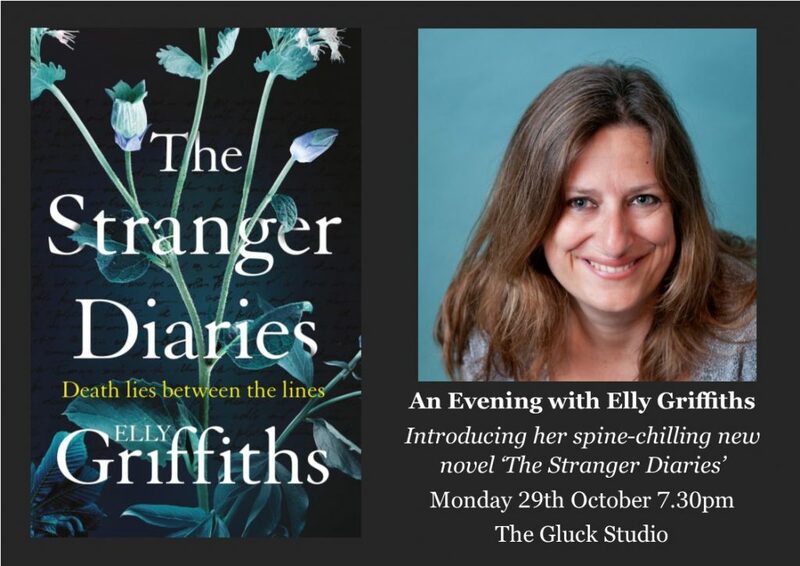 We are delighted to welcome Elly Griffiths (aka Domenica de Rosa) back to Steyning, to introduce her bewitching, terrifying new standalone novel. ‘The Stranger Diaries’ is a contemporary Gothic thriller, described by Louise Penny as “Goose-bump spooky, smart, and haunting. At once a re-imagining of, and a homage to, the great Gothic thrillers of the past.” Elly will tell us more about the book, her inspiration, and her fascination with the great Victorian Gothic novels. Clare Cassidy is no stranger to tales of murder, as a literature teacher specialising in the Gothic writer R.M. Holland. Then Clare’s life and work collide tragically when one of her colleagues is found dead, a line from an R.M. Holland story by her body. Elly Griffiths was born in London. She worked in publishing before becoming a full-time writer. Her bestselling series of Dr Ruth Galloway novels, featuring a forensic archaeologist, are set in Norfolk. The series has won the CWA Dagger in the Library, and has been shortlisted three times for the Theakston’s Old Peculier Crime Novel of the Year. Her other popular series, the Stephens and Mephisto stories, is based in 1950s Brighton. She also writes romantic fiction under her real name of Domenica de Rosa. Ticket price is £15 to include a copy of ‘The Stranger Diaries’ (£12 for Steyning Bookshop book group members), wine, and nibbles.